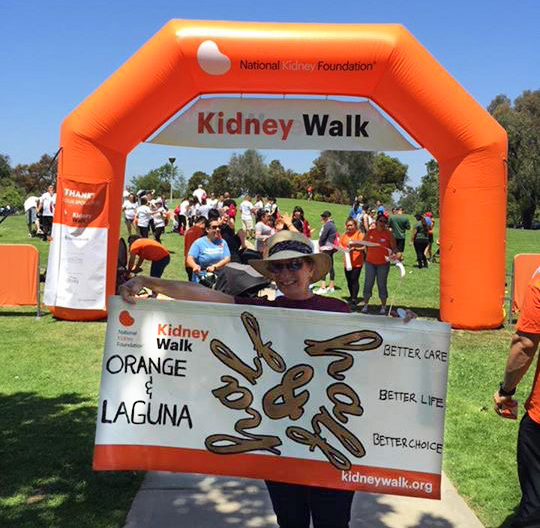 Half Orange plus half Laguna Hills, equals one dynamic Satellite Healthcare Kidney Walk team called Orange County Half and Half. “We were all a team doing this together,” Team Captain Candice Brewer said of her team that included Satellite Healthcare’s Orange, Calif. dialysis center and Satellite Healthcare’s Laguna Hills, Calif. dialysis center. As a Charge Nurse at the Orange dialysis center, Candice knows the importance of working together for a common goal. Every day, she works with dialysis patients and a skilled team of nephrology nurses, social workers, dietitians and patient care technicians. The team, Orange County Half and Half, reached and then exceeded their walk goal thanks to every team member’s efforts. This included restaurant fundraisers, a recycling program, social media and simply asking for help. Every bit counts! 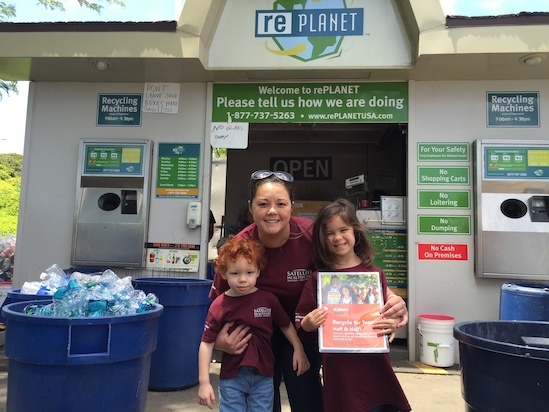 Orange County Half and Half began collecting items to recycle months before the walk. “I talked to staff and patients individually about it whenever I could. One patient raised over $600 himself and I was just amazed and surprised that he was getting so involved,” Candice recalled. Cathy Wilson-Bates, an active team member, followed Candice’s lead, raising $800 in her first week. 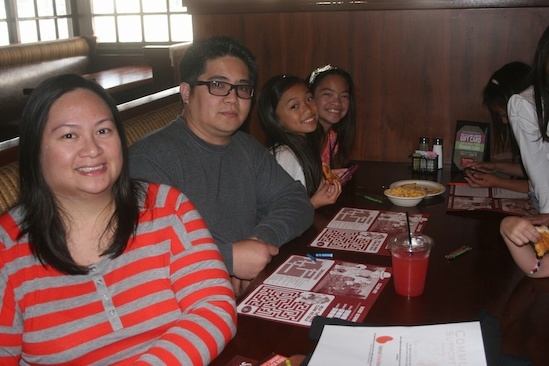 Satellite Healthcare Orange and Satellite Healthcare Laguna Hills staff and their families enjoyed bonding time during a team restaurant fundraising event. “Candice’s energy and excited-ness would just spread throughout the centers. It was a chain reaction,” Cathy said. 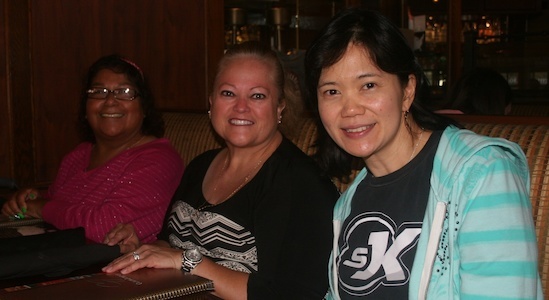 The team grew stronger thanks to the support of NKF’s local office, which held regular team captain group calls, walk kickoffs and visited each of the team’s centers in Southern California. “NKF’s support helped me overcome any challenge I came across, and helped me understand how best to reach out to people. NKF’s inspirational walk video and stories made me feel like my heart was more involved,” Candice said. Even patients and their families were excited for the walk! As the heart of the two-center team, Candice saw the team become one big family as staff, patients and family members joined in. “The patients felt, ‘Wow, they’re really connected.’ They didn’t see it as Laguna Hills and Orange. The patients saw the comradery and how positive that was for the greater good,” Cathy observed. 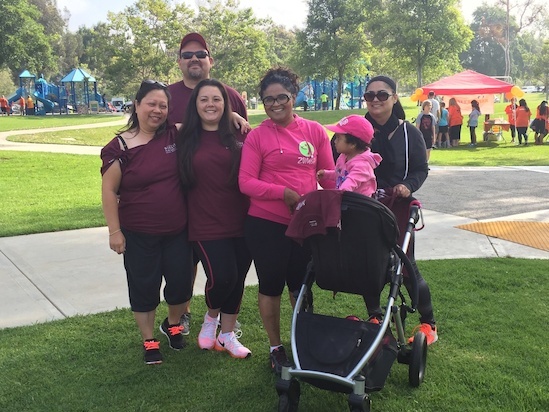 Patients on the team were proud to raise awareness about kidney disease in their community by walking alongside their dialysis center care team. That team includes dialysis nurses, patient care technicians, renal dietitians and social workers. The care team at Laguna Hills and Orange provide dialysis services through hemodialysis and peritoneal dialysis. 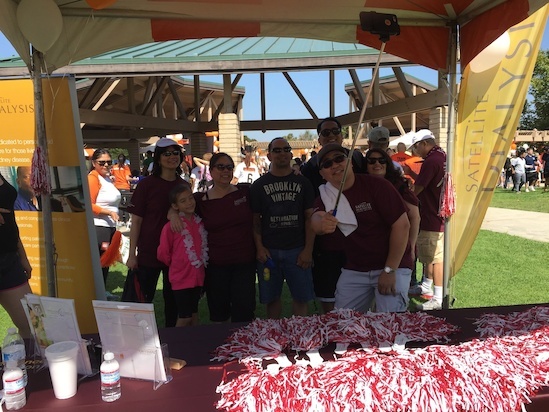 The Orange County NKF Kidney Walk was the culmination of all their hard work, and it was evident to all who put their walking shoes on. “Attending the Kidney Walk in Orange County was a blast. I enjoyed being a team member of this strong and successful group of individuals who came together to raise funds for and awareness of kidney disease. Our Satellite Healthcare team exemplified our company’s mission and values. We are so proud to be a part of this CKD community,” said Robin Maita, Regional Vice President at Satellite Healthcare, who was one of the 91 Orange County Half and Half team members. Half and Half team members taking a selfie at the Satellite booth. Satellite Healthcare, a not-for-profit provider of kidney dialysis services, has been a strong supporter of NKF for more than 40 years. The Satellite Healthcare National NKF Kidney Walk Team participates in 11 walks through about 30 local teams. Satellite Healthcare has a well-recognized, enduring commitment to philanthropy and the CKD community, from funding millions of dollars in research grants to sponsoring kidney walks nationwide. Satellite is committed to advancing the standard of chronic kidney disease care so patients can enjoy a better life. To learn more about what Satellite Healthcare, a leading nonprofit provider of kidney dialysis and related services, is doing to shape our industry and elevate the standards of patient care and innovation, visit www.SatelliteHealth.com.